Vive Pro or Vive? If you're all about HTC's VR headsets, then this might be a conversation you're privately having with yourself. If you already own the first Vive then you might be wondering if you need to upgrade the virtual reality headset in your life. 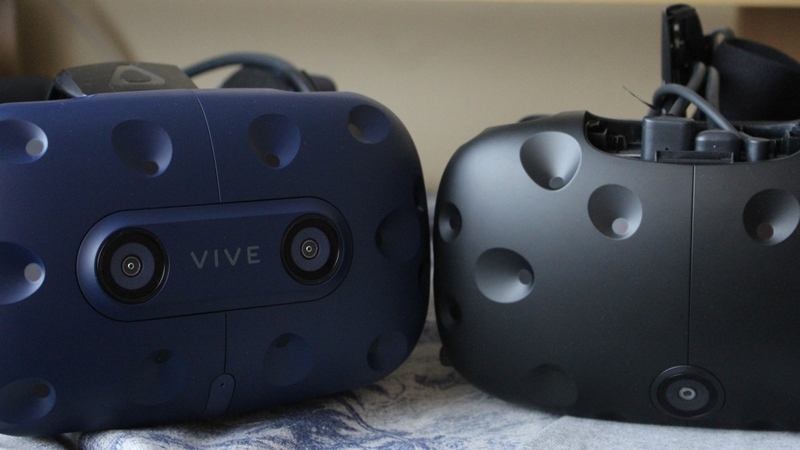 If you're thinking of splashing out for the first time and you're sold on HTC's VR goodness over its rivals, then you may be wondering whether you need the newest model or you could save some money by picking up the first Vive. Both have similar setups, run the same VR games and experiences and have access to much of the same peripherals to improve that immersive feeling. We've spent a fair amount of time with both the Vive and the Vive Pro to get a better sense of the key features that will go some way to helping you decide which of the two Vive headsets is a better fit for you. Got any additional questions? Let us know in the comments section below. While these headsets might look very similar from the front, beyond that sit some differences that will undoubtedly impact on the way you experience the the action. It really depends on how big a deal you think those differences are going to be for you. The most obvious one is the way that the headsets are kept in place on your head. The original Vive relies on an adjustable elasticated strap, while the Vive Pro now features a hard plastic band with significant cushioning around where the back of your head rests against the band. It also uses a twisting wheel to tighten up that fit. HTC says that the new Vive Pro is lighter than the original, but if we're being honest, this weight difference isn't too noticeable. Still, we'd be inclined to say the Vive Pro feels more comfortable to wear for longer periods. Just. Something we do favour on the newer headset are the headphones that are built into the strap. Both for convenience and because it's one less trailing cable, this is a great addition to the setup. It includes physical volume controls and delivers impressively rich, powerful sound quality. We should say though that you can purchase the same Deluxe Audio strap and ditch those additional headphones for the first Vive, as well. In the comfort department, the Vive Pro does additionally support the ability to adjust the distance of the lenses from your eyes, which does make it more accommodating for glasses wearers. One other feature to mention (which will mean more to developers) is the additional front-facing camera you'll be able to spy on the front plate. It's not clear how this feature will be utilised, but does appear to indicate that this will give the Pro an upper hand on some future VR experiences that does embrace the additional camera. If we had to pick one we'd prefer to VR in, then the Vive Pro would just shade it. It's addressed some of the obvious design issues and limitations of the original. Plus, it's got that lovely new blue look we're fans of as well. Setting up a proper VR headset like the Vive takes a bit of time, so if there's any way that process can become easier, we're all for it. Essentially you still need a PC powerful enough to run the operation along with a pair of Vive controllers and a couple of HTC's base stations to unlock the ability to track movement in VR. Connecting the headset to a PC still requires the same process, although the link box that brings the two together has changed for the better with the Pro. There's one less cable to worry about and a button on the box to switch on the headset when you're ready to play. But back to those base stations and controllers, and this is important. The current Vive Pro setup doesn't include the base stations or the controllers that you can now get bundled with the Vive. It does use the same base stations and controllers as the first Vive, but if you don't already own them you will need to pay an additional $134.99 each for the base stations and $129.99 each for the controllers. Or invest in the Vive Pro bundle (more on that later). The headline feature on the Vive Pro is the improved display, which may well be the biggest reason you might be persuaded to go for the newer Vive. As well as moving from OLED to AMOLED display technology, HTC has ramped things up on the resolution front. The Pro offers 2,880 x 1,600 (615 PPI) resolution in comparison to the 2,160 x 1,200 (448 PPI) offered on the first Vive. As a result, there should be an upgrade in just how clear and sharp the VR environments look when peering through those lenses. The Vive offers one of the best displays out there on a VR headset, but with the Vive Pro, things get taken up a notch. The improvement in the resolution and clarity noticeably enhances that immersive feeling in comparison to the original. We've tried a bunch of games and experiences on both headsets and the Pro definitely offers sharper surroundings capturing more detail than its predecessor. While you can expect the same 110-degrees field of view on both headsets, the extra pixels in play on the Vive Pro make it a more satisfying experience. As we've already mentioned, you still need those base stations to enable you to move around in VR worlds. The space required for both headsets is still a minimum of 2 x 1.5 metres and maxes out at about about 5 metres. That is set to change, at least in the case of the Vive Pro, which will also support the next generation base stations launching later this year. This will enable Vive Pro owners to link up more than two base stations to increase the amount of space to 100 metres squared. So if you've got some big VR space put aside, you'll be able to move even more freely. Right now, though, both are limited to the same amount of free VR space so there's nothing to separate the two as far as the room you have to play with goes. We should also talk about HTC's new wireless adaptor, which does spell the end of worrying about tripping over trailing cables. This is another step towards making high-end VR more tethered and standalone. But this add-on doesn't come bundled in with either headset, so the tracking setup at its core is ultimately the same for both headsets. Let's talk numbers. The HTC Vive Pro is currently priced at $799 and remember that only gets you the headset. HTC has since announced a Vive Pro starter pack bundle, which bags you the headset, controllers and two base stations for $1099. That's roughly $200 less than what it would cost to buy all the parts separately. On the other hand you have the Vive, which has been given a permanent price cut and is now down to $499. That gets you the controllers, base stations and of course the Vive headset. It's worth factoring in the competition where you can now pick up an Oculus Rift bundle, which includes the headset and Touch controllers for $399. So, the big question: which one do you buy? If you want the very best of what high-end VR has to offer, then it's the Vive Pro. Just be prepared to shell out a whole lot more for the luxury of that resolution upgrade and more comfortable design. There will be more goodies to improve the Pro experience later in the year, so there's of course that to factor in as well if you can't afford to spend big. For sheer convenience and value for money though, the Vive is still a great entry into the world of high-end VR. Even two years after launch, it's still doing a fine job off showing what VR is capable of with all the vital pieces needed to do it already bundled in. And if you want that Audio Strap or the wireless adaptor to ditch the cables and get a little more of the Pro feel, then those are out there too.